On this page you will find items that we currently have for sale. Please come back and visit us often as our inventory is ever changing and we are bringing in new and interesting items all the time. Feel free to contact us if you have any questions. We are always ready to help! 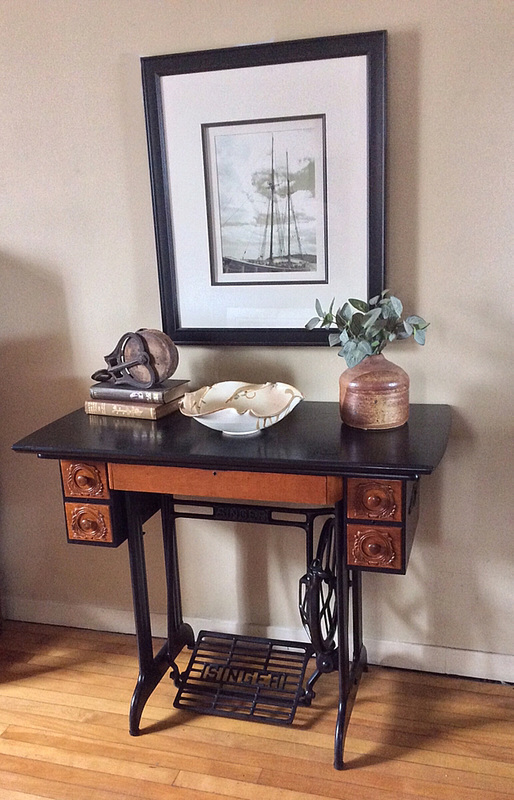 This beautiful antique Singer Sewing machine has been repurposed to use as a table, desk or vanity with a replaced antique wood flat top. Its in great shape and still has all the original drawers and metal base. It's been professionally painted a soft gloss black oil paint. All drawers work perfectly. The wood grain still shows through the top. Dimensions are 37" long x 19" wide and 30" high. Asking $245 for this one of a kind piece, reduced from $295.